Scripture Memory is Thinking God's Thoughts! He loves when we do that! This is all about the BENEFITS of Scripture memory. And let me tell you, God is no cheapskate when it comes to lavishing His benefits upon those who obey Him. Truth that sets you free. JOY in the LORD, which is constant and not dependent upon the ups and downs of circumstance. PERFECT peace! PERFECT! What can top that? 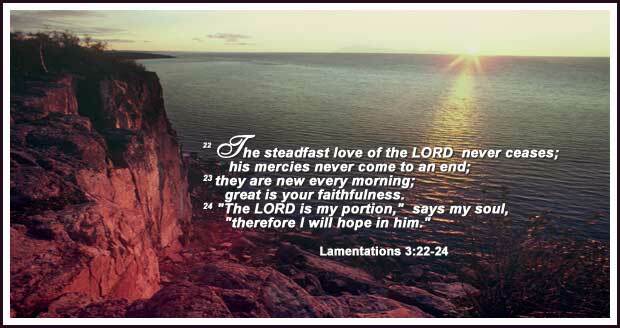 God’s steadfast love and Mercy. God is with you in the midst of trials. God sings your praises to the angels in heaven! There are hundreds more — perhaps thousands — that we can have. But these are verses that I have found to be some of the most practical and beneficial verses in the whole Bible, because they deal with some of the major areas of life that we struggle with. How I would love to have known these principles earlier in my life. Well, I didn’t, but I know them now! And I long to share with you what God has poured into me. Get ready to be blessed! Jesus’ statement about “remaining in His Word” is a clear, unambiguous command to practice Scripture memory. If Eve had practiced Scripture memory back in the Garden of Eden, she would have known exactly what God said. She would have known the Truth and the devil wouldn’t have been able to persuade her. Perhaps we’d still be in Eden! We must know God’s Word, but that knowledge must move beyond intellectual “head knowledge” to where it penetrates our hearts. That expression “on your heart” refers to Scripture memory. The life-transforming principles of the Bible must be our source of wisdom for the decisions we make. We must pass on this handling of the Word of God–including Scripture memory–to our children. The Word of God should be the first thing we think about as we rise up from sleep. We must: learn about and discuss God’s Word at home, grab opportunities to discuss and apply God’s Word during the day, and let His Word comfort our minds, our hearts, and our spirits as we lie down to sleep. Again, you can only do these things after you’ve done the Scripture memory part. Scripture Memory Benefit: FREEDOM From Demon-Induced Fear! The fear that you are experiencing is not from God. Satan is the author of your fear! Here is perhaps the most important thing to know about fear: it is not just a physiological response to circumstances. Fear is a spiritual phenomenon, inflicted by Satan and his demons. God built a “flight-or-fight” mechanism into you for your protection. The rush of adrenaline known as a panic attack will also, in the face of real danger, give you an instant boost of strength. But Satan and his demons, as they always do, have taken God’s gift and have corrupted it by using it against you. They do it by planting thoughts into your mind, thoughts of impending disaster and doom. They are behind all of those “what-if” questions that tie you in knots of fear. The “voice” you “hear” in your thoughts sounds like your voice. But often, it isn’t. It may be the voice of a demon, impersonating you by “whispering” thoughts into your mind. In this way, demons are able to trick you into believing their lies. In the next two sections, I’m going to expand on two of those: JOY and PEACE. You can live “above your circumstances” and rejoice — when your joy is in the Lord! This is not just “Bible-speak”. This truly happens. But God is longing to help you rise to this level of spiritual maturity. This is living in the joy that flows from a constant awareness of your intimate relationship with God. You’ll trust Him–when you know for certain who you are in Christ. Here’s a very practical application. You’ve noticed the price of gasoline increasing. And how do most people respond? By complaining, and worrying about their finances. But at the root of that worry is fear–that God isn’t really going to provide for their needs. That line of thinking won’t take you anywhere good. So let me suggest a radically different response: Choose to praise God instead! Praise Him because fuel is available! Praise Him because you have a car! Praise Him for the money in your account! Praise Him because you are healthy enough to drive! Praise Him because you have a license! Praise Him because there are highways and bridges to drive on! Praise Him because no matter what you choose to name, ultimately He provided it! I want you to know that I actually do the above every time I go to the gas station. It keeps my mind on God and off of the fact that I’m often paying more to fill the gas tank that I paid for my first car! I go around throughout the day praising God and thanking Him for what I have. When you go about praising God and recalling His Word, the devil can’t get a word in edgewise! Here’s how this works: just as the S-T-R-A-I-N of lifting heavy weights strengthens your muscles, God uses the strain of adversity to strengthen your faith in Him. Happiness rises and plummets according to fickle circumstances. Joy IN THE LORD is abundant and constant. And you can choose to have it! Wouldn’t you agree that you can deal with life’s issues more effectively from a position of peace and Joy in the Lord rather than from fear, worry, doubt, anxiety, and panic? Speaking of peace: what could possibly be better than this? Scripture Memory Benefit: Having God keep you in PERFECT PEACE! When you keep your mind firmly fixed on God, he gives you His perfect peace. What a great deal that is! This is not just “Bible-speak”. This truly happens. The world may gives you peace according to your circumstances. But when you’ve surrendered your life to Jesus, He gives you “peace that surpasses all understanding”. But again, the offer is conditional. God offers perfect peace to those whose mind is stayed on [focused on or fixed on] Him. by preaching His Word to myself regularly throughout the day. It amazing how, once you’ve done enough Scripture memory, God will bring to your mind passages He wants you to apply in a particular situation. by trusting Him every time I hear a “what-if” from Satan. God does not deal in “what if’s” in my life. He knows what’s going to happen. I choose to believe that God is trustworthy, that He is good, and that He can handle whatever comes up. Trusting in myself has not given me peace. But I do know Who holds the future! Scripture Memory Benefit: God’s PROTECTION from the devil! Someone has said that the Holy Spirit is the most under-employed being in the universe. How it must grieve the Spirit, to watch us flailing around frantically trying to gain control of our lives. We cannot do it. And one of our biggest obstacles is unseen: the devil. God has extended an offer of help, to all who will submit to Him. 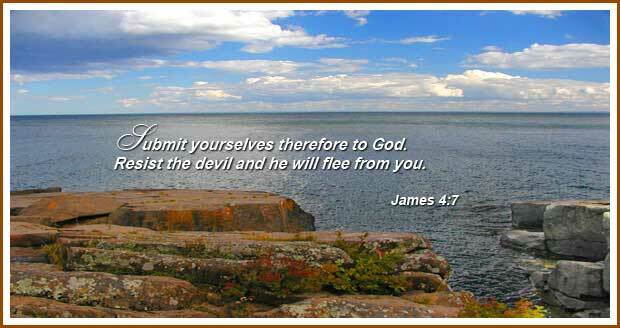 When you live a life of obedience (submission) to God, He pretty much takes care of your devil problems for you! That’s how we must “submit ourselves therefore to God” and in the process “resist the devil.” The Word of God is our weapon against demonic beings who would otherwise easily devour us. Then, as the Word takes root and begins to grow and bear fruit–and recall: one of the Fruits of your relationship with the Holy Spirit is self-control–now you have the power of the Holy Spirit of Jesus Christ active in your life, and you can easily resist the devil. This illustrates the difference between my in my own strength vs. the power of the Holy Spirit working through me. One day, as one of my sons and I were stopping for a red light in the left-turn lane of a busy street, the engine in my minivan quit. Although the street was “nearly” level, we had to really S*T*R*A*I*N to push the van around the corner and into an area where it was out of the way. That task left us exhausted. A year or so later, I found myself waiting at a red light in another left-turn lane. This lane had a substantial incline. Nevertheless, when the green arrow came on, with just the slightest pressure of my foot upon the gas pedal, the same minivan moved easily up the incline, around the corner, and quickly accelerated to highway speed. OK, it’s kind of a lame example. But if you understand that, perhaps you can understand how the power of the Holy Spirit helps us with our struggles. There always a part that we have to do first. In the last half of my anecdote, my part was to press my foot against the gas pedal. Once I did that, the power of gasoline being burned in the cylinders of the car’s engine caused the car to move forward without me having to do anything else. In the same way, in areas of obedience to God, there’s always a part I have to do first. Once I’ve done my part, God does the part I cannot possibly do. When you are a faithful steward of what God has given you, He shields you from the devil. The devil has incredible power over us, but God has him on a leash. When you walk in obedience to God by giving back to Him the first 10% of your income, He promises He will not allow the devil to destroy your finances. As we become more and more obedient — submitting to God — He strengthens the protective shield He has put around us. 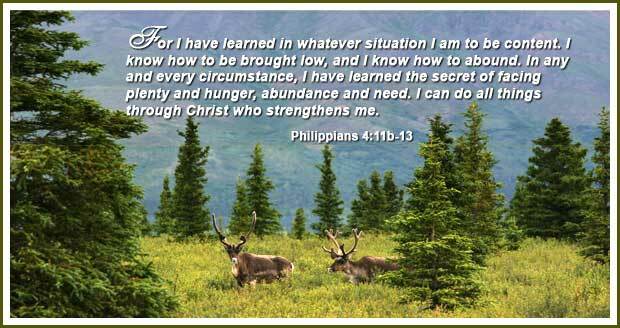 6) Scripture Memory Benefit: Contentment, Even In Difficult Times! We can know contentment even in lean times. Jesus Himself promises! Contentment is a virtue that does not come naturally. But it can be learned. If Paul could write about contentment from a prison cell, who of us cannot learn contentment in the affairs of our lives? But we must choose it, and then God promises to help us. But if that’s truly our goal, we doom ourselves to failure. We can never succeed, because we cannot possibly reach the goal. Like a mirage shimmering on the horizon in the desert heat, the goal of “more” will always remain an illusion in front of us, always beyond our reach. It’s like a treadmill that wears us out — and takes us nowhere. By embracing the priorities of the world system–the system controlled by Satan and his demons–we give others far too much power to control our lives. Only one opinion really matters: what does God think of our priorities? For most of us, it takes some adjustments in attitude and priorities. That was certainly true for me. But as you do more and more Scripture memory, you give the Holy Spirit more material to work with, and He begins the process of changing you from the inside out. When you become aware that this is happening in your life, do all you can to cooperate with Him. Scripture Memory Benefit: God’s MERCY is new every day! God’s love for you and for me is constant. Every day He gives us another chance to grow in obedience to Him. Therefore, I choose to put my full trust in Him. He has never let me down! Aren’t you glad God isn’t like people? With most people, you’re lucky if you get a second chance. How does that old saying go, “Fool me once: shame on you! Fool me twice: shame on ME!” Some will hold a grudge for a long, l-o-n-g time! You may have messed things up royally today. But tomorrow, He’ll be right there for you, longing to forgive you, help you, calm you, strengthen you, encourage you and pour out His steadfast love and mercy upon you. He really means it. Don’t make the mistake of thinking of God as being like the people you know. People will hurt you, people will misunderstand you and people will let you down. God will not When God allows pain in your life, it’s always for a good reason. It’s to help you. And He will never let you down. 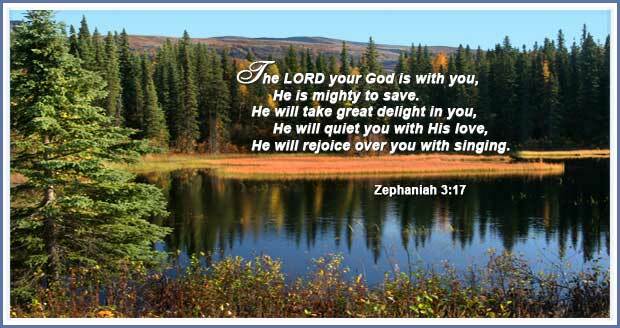 Scripture Memory Benefit: God is ALWAYS with you! Late one night, when the devil attempted to engulf me in panic, I woke up enough to realize what was happening. In the darkness of our bedroom, I said softly, “God, I know you are here with me.” Then I spoke the verse above from memory. INSTANTLY that “spirit of fear” left me! That true story in the caption directly above more than proved to my satisfaction the benefit of Scripture memory. Once I experienced first hand how demons flee from the spoken Word, the Word of God became my weapon of choice. Isn’t it reassuring to know that God is always with us, even in difficult times? Throughout the Bible, God promises He will never leave nor forsake us, that He will be with us always. Because we’re not in Heaven yet, our journey through life will be marked by a succession of problems and difficulties. That’s what those references to “passing through the waters” and “walking through fire” refer to. And you’ll notice, it doesn’t say “IF” troubles will come. 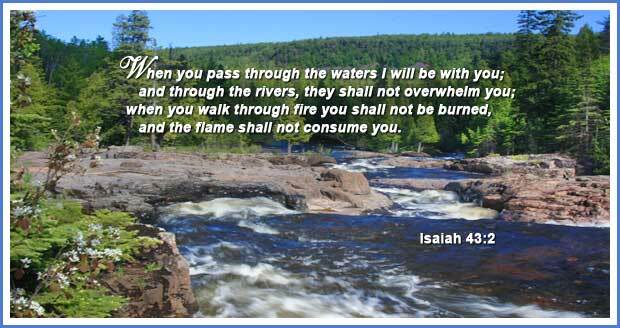 It says When you pass through the waters… When you walk through fire…”. It’ll be hard, but you’ll make it through. That’s a promise from God! That’s also the power of God. Because we have a free will, God will not force His help upon us. Satan and his demons are not so polite. They work at jamming our minds with thoughts calculated to keep us distracted and keep our focus away from God. But knowledge is power. Because we know what Satan is doing, we also know to turn to God for help! 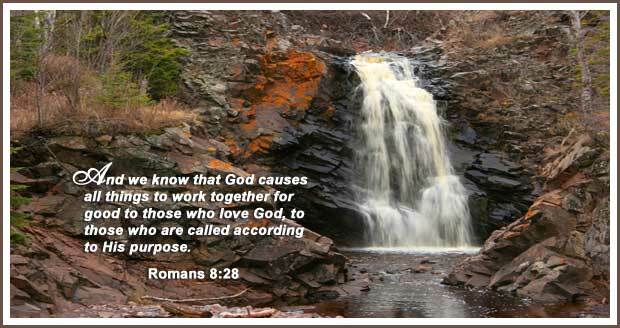 Scripture Memory Benefit: God works ALL things together for good! 9) God Will Make Something Good Out Of Your Problems! Heavenly Father, I choose to trust You when You say my trials are just for a season. I know something good will come out of it. I choose to step out in faith as I wait for You! Isn’t it great that you can know truths about God’s ways, including His promises to help you? (Some people actually believe we can’t know any truth!) And isn’t it fantastic to realize that He’s working for your good to give you His very best? God never wastes an experience. He will take what seems to be an absolute “train wreck” of a life” and use it for His purposes. He didn’t cause your problems, but He allowed them to happen for reasons you may not know until you’re in heaven. The fact is: He saw your train wreck coming before He created the universe! God’s plan is to strengthen you for His work. He’ll take your mess and make it your message. He will teach you things through adversity that you would never learn unless He allowed some rain to fall into your life. These lessons are far more bearable when you know God has so much confidence in you that He allows them to happen. The “fire” of the adversity you are in may be hot, but God’s hand is on the thermostat! He knows exactly how much you can stand. This is the process God uses to make us more like Christ, so we can do Christ’s work. Scripture Memory Benefit: God rejoices over YOU with singing! 10) God Isn’t Mad AT You; He’s Mad ABOUT You! Dear Father in heaven, for much of my life I didn’t know how much You loved me, or that You even cared about me at all. I am overjoyed to learn just how much You really do love… me! Your Word has truly opened my eyes. Thank you! Some people keep God at a distance, picturing Him as an angry old man with a big stick who is just waiting for them to so much as look sideways, so He can pound them down. That image of God is a lie from the demons in hell! Here’s the truth: God loves YOU! He’s not mad AT you; He’s mad ABOUT you! I once heard a sermon where the speaker told us to draw a circle around the word “world” in John 3:16 in our Bibles. Then he had us write the word “me” beside the circle. The idea was to get each of us to read it and start thinking of it like this: “For God so loved ME that he gave is only son..” The person said, “even if you were the only person in the world, Jesus would have died on the cross for YOU! Because we are finite beings in a finite universe, it’s impossible for us to fully comprehend the concept of an infinite God. If you divide infinity into two parts (or two zillion parts), each of the parts is… infinite!! Each one of us has available to us ONE HUNDRED PERCENT of the infinite God who created the universe! I cannot truly understand how that works, but I believe it. I don’t know about you, but I find it reassuring to realize that I cannot understand God. I mean, think how small a God He would be if any of us could understand Him. You may ask, “How can I get to know God?” We get to know God in the same way we get to know each other. We know other people by the words that they say and the works that they do. It’s the same with God. We know Him by the words that He said and the works that He did. And we get both of those from reading His Word, the Bible. You Can’t Read It Just Once! Your Mind Needs Constant Renewing! If someone were suffering from, for example, pain in their lower back (as I have in the past), that person could very likely reduce or eliminate that pain by practicing a discipline of regular stretching and exercise. But you cannot just do the exercises one time and expect any lasting benefit. It’s the same with Scripture memory. This has to become a habit, a part of your daily life. And like exercising, if you do it, you reap the benefits. SUMMARY: The entire Bible was written for our benefit! Just think of all the devotional books that have been written and all the sermons preached, every one of them applying biblical wisdom for our benefit. There must be thousands, perhaps millions of individual applications. It make me wonder: is it possible that, like God Himself, the number of practical applications of biblical wisdom that could be written about Him is infinite? There is an old saying: “What you don’t know won’t hurt you”. Is that true? There may be examples someone might relate to support that. But the converse could also be argued. What if you took hold of a bare electric wire, because you didn’t know that it was connected to a live circuit. Wouldn’t you agree: if you’ve got all those benefits from God in your life, you are equipped and protected to handle whatever the world throws at you, right? The really awesome thing is: ANYONE CAN HAVE THIS! Hi Jan,please how des one make good progress with scripture memory if anxiety is slowing one down from even concentrating and reading the bible? Oh, the devil will work overtime to keep you from allowing God to download His Word into your mind and heart. See what it says there “Rejoice always”; “Be anxious for nothing”; and God’s PEACE will come to you and you won’t be able to explain it except that you know it’s from God. I can remember when, as a small boy, I was struggling to learn to tie my shoe laces. I just couldn’t do it. But my mother patiently showed me again and again, then prompted me as I would keep trying. Eventually, I was able to do it by myself. Same with this. Just determine that it’s important, so you choose to ignore the devil and do God’s will. Just watch! It will get begin to get easier. Thank you, Emmanuel. I appreciate that blessing! I very much enjoyed your message of hope, Jan! Thank you! Thank you! My sister, who loves Jesus too, subscribes to you and sent me your link! may i say there was something very different about yours versus the many, many others she has sent me in the past!! I actually read all of your message and enjoyed it completely!! I even subscribed myself which i dont often do!! May God continue to bless you with the gift of writing hope to all!! I have a very very sick friend and she could so benefit from the way you know and teach Gods promises! I fall so short to help my friend, as my knowledge of the bible, and Gods promises is so small! I pray that i could just open my mouth and the words that come out would not be mine but his!! i pray that i could touch someone and God would heal people through me!! You gave me hope to seek him much more than i do! Thank you, Jan!